There's no question that over the last few years, enterprise infrastructure has become increasingly complex. Among on-premises platforms, cloud environments and data centers, IT leaders have a lot to keep track of and require dynamic visibility over all of these assets. This is where an IT infrastructure performance management suite like Galileo Performance Explorer becomes a distinct advantage. Galileo is a best-in-class solution providing an array of key features and functionalities that can make a real difference for those in charge of business IT systems. Server systems, including Linux, Windows, VMware and other hardware. SAN environments, including both Brocade and Cisco MDS. Storage environments such as Oracle Database, IBM A9000, XIV and DS8000, IBM Flash, Infinibox and NetApp. This robust monitoring ensures users get the complete picture of infrastructure performance. Galileo can also pull and present data from on-premises systems, hybrid environments and cloud platforms, capabilities not offered by other solutions available on the market today. What makes Galileo stand out? Galileo's unique features offer users a distinct competitive advantage. Leveraging data from an array of different on-premises and external infrastructure systems isn't the only function that makes Galileo stand apart in the industry. 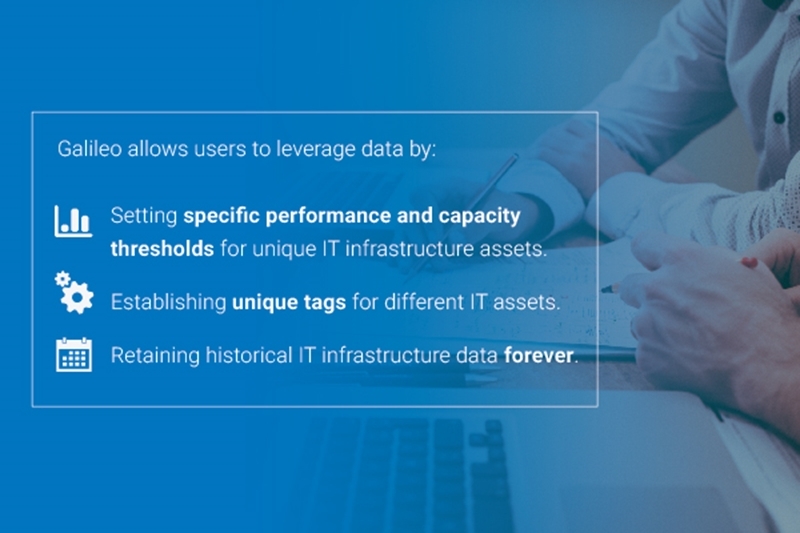 Galileo enables users to set specific performance and capacity thresholds for unique IT infrastructure assets. In this way, should a server, SAN or storage system approach this user-created benchmark, Galileo sends a real-time alert. This enables a company's IT team to work proactively to address potential performance issues before they impact end users. Galileo also includes Tag Manager, a critical capability not offered by other infrastructure performance management suites. Tag Manager lets users establish unique tags for different IT assets, allowing them to group together items in ways that make the most sense for their businesses and specific goals. For instance, assets can be tagged and grouped into a category to organize systems for consolidation or to ensure that the IT team can keep a close eye on certain resources. As previously noted, Tag Manager in particular can support and streamline a number of critical use cases, including cloud migration, server consolidation, and merger and acquisition processes. Unlike other similar solutions, Galileo Performance Explorer is one of the only infrastructure performance management (IPM) suites available that does not purge historical IT infrastructure data. What's more, when data is presented in Galileo dashboards, the platform doesn't average it, providing a more in-depth and complete picture of an enterprise's IT performance. And because historical data is always available, users can seek out usage patterns and other insights to make important decisions about the future of the company's infrastructure. Galileo Performance Explorer is an advanced and innovative IT management suite, but this only scratches the surface of the technology's available features and functionality. To find out more about what Galileo can offer your company, contact us today for a free trial.